Sgor an Lochain Uaine, also known as "The Angel's Peak", is a striking summit, particularly when viewed from the Cairngorm-Macdui plateau. The Northeast ridge offers the climber an easy, but spectacular way directly to the summit. 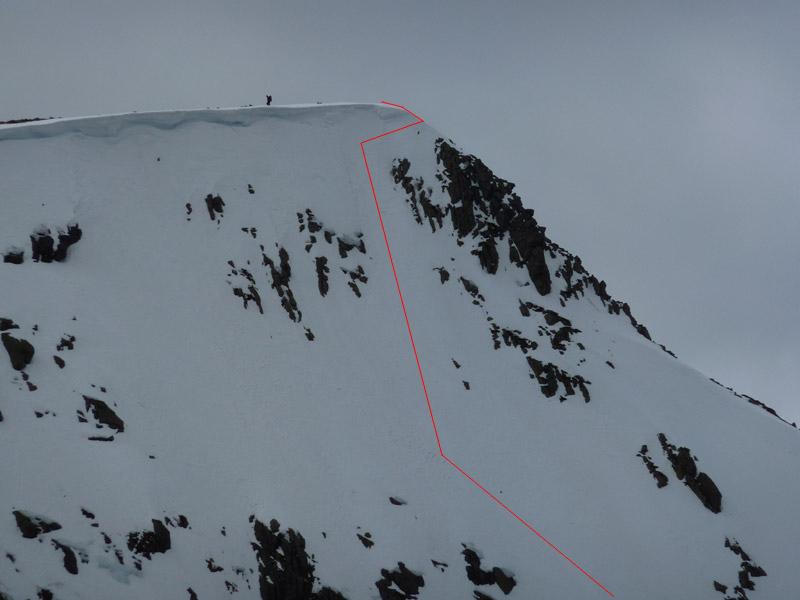 However, the Northeast face offers the skier a memorable experience descending towards Lochan Uaine. The Northwest face has been skied as well, but the line is unclear at this point. If approaching from Linn of Dee, you can skirt the summit of Cairn Toul and head for the col between it and Sgor and Lochain Uaine. From there, you can get a view of the Northeast face, although from this viewpoint it can look broken, when it's not. 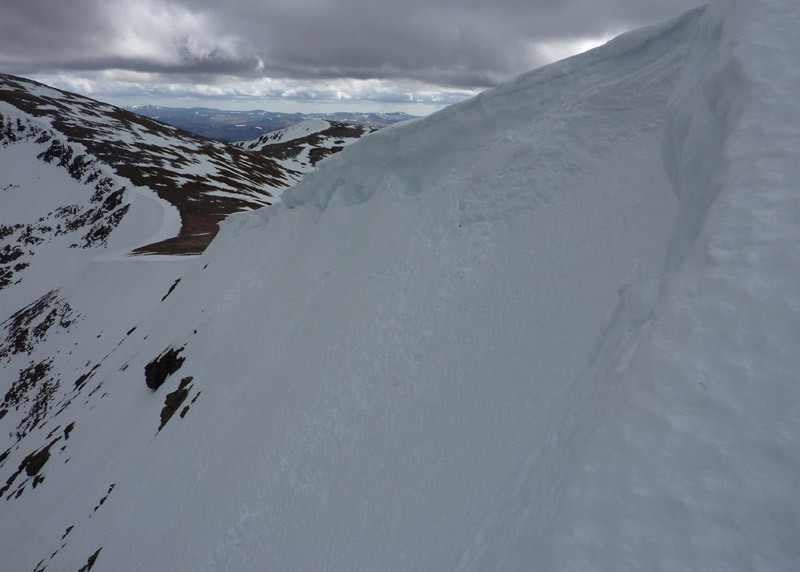 Alternatively, the longer approach round the base of the Lairig Ghru could involve either an ascent of the Northeast ridge, or an ascent to the col via the break in the cornice. The Northeast face can often be loaded with snow when the Northwest face is almost bare. 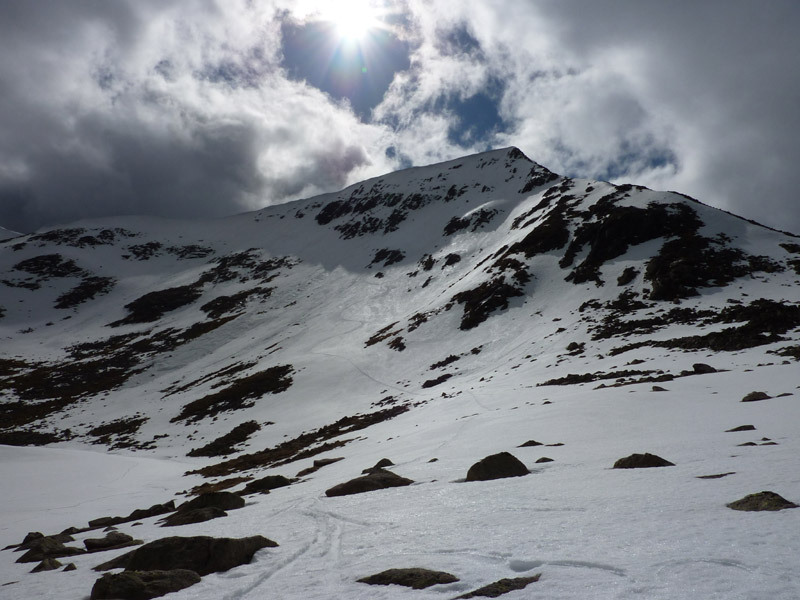 In the winter of 2010, when the snow bearing winds were predominantly from the Northeast in the early part of the winter, the results were clear late season, with the Northeast face patchy compared to the Northwest face of Cairn Toul. The reverse is normally true. The Northwest face seems to hold onto less snow in either situation! 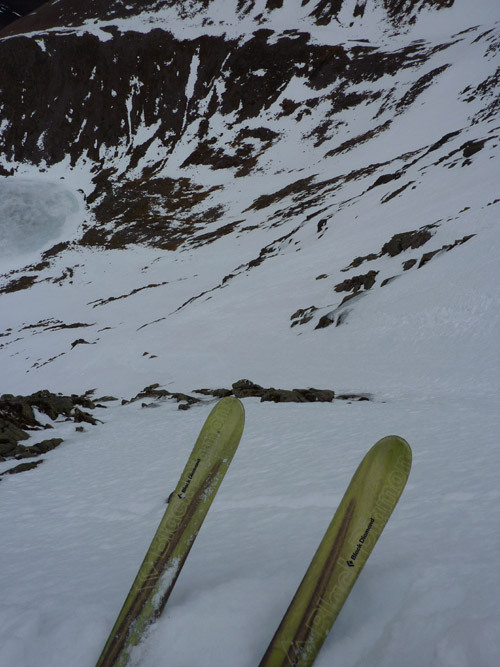 If a change of mind occurs, it is still possible to ski into Coire an Lochain Uaine by heading back down the South East ridge of The Angel’s Peak to the col with Cairn Toul. There is a small ridge leading into the corrie at 958974. The skiers right side of this usually offers a break in the cornice, and an easier short descent can be made on the Cairn Toul side of the corrie, following the extension of the ridge into the corrie, which holds snow well in a thaw. If you have the legs for it, whichever route you do, you could head up onto Cairn Toul and descend one of the lines into the Lairig Ghru. There are 2 Scottish Avalanche Information Service forecasts worth considering for Sgor an Lochain Uaine. The descent from the summit of The Angel's Peak must be one of the finest in the Cairngorms. Standing at the top with the lochan seemingly directly below you, it is an intimidating position. If the snow conditions are good, it's a memorable place to ski. Locating the start of the route is not without risk, as it involves locating the top of the narrow North East Ridge, which is not obvious until directly above it, and is only 2 or 3 metres wide at the top. Get it wrong, and you are likely to be standing on (or fallen through) a cornice, either above the Northwest face, or the Northeast face. The start of the route is either over the cornice (if brave enough! ), or to descend the North East Ridge of the peak for a couple of metres until it is possible to traverse in skiers right above the rocky outcrop to below the cornice. The first 2 or 3 turns are the steepest, and the angle relents with each turn. On the way down you need to be aware of bare and/or icy patches. The run out should be fine, although there is a large loch to avoid! Notes: Not graded in climbing guides, but the top section is steep enough to be Grade I.